Doors Open 5pm, showtime 6-8.30/9pm (with intermission). Join Alma Mater as they celebrate the launch of their new album, Meu fado meu. Their passion for passionate music brought the members of Alma Mater together. Alma Mater reawakens the voices of worlds gone by, bringing to life the traditions of Portuguese fado. The music is fiery, gripping, tense, yet surprisingly delicate. Led by singer Yuliya Mik, who carries an old-world sensibility and a passion for the music of times before her own, the group breathes new life into the haunting and beautifully robust fado melodies. With its rare combination of musical influences and cultures, the group creates a fresh and faithful sound. Alma Mater has taken to Melbourne’s cosiest hideaways and top music venues and festivals around the country. 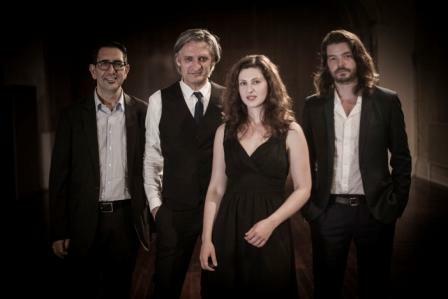 The group proudly launched their debut album, Fado ao largo (translation: ‘fado from offshore’), to a sold-out crowd at the Melbourne Recital Centre Salon in May 2015. This second album has been a long time in the making. A long gap between the two albums has seen the group rest, re-form and renew, blossoming into its current self. In this new album, Meu fado meu (translation: ‘my fado, my fado’), the group pays tribute to the rich traditions that produced the captivating style of music that is fado, while daring to infuse this traditional style with its own contemporary voice. Alma Mater will take you back in time, to a world where delicate beauty and unrefined passion walk hand-in-hand down the snaking corridors of an antique city.